Dhabas have got a makeover. They are becoming new magnets for the young ‘n’ hip. These highway joints have jazzed up their act with an eye on the city youth who are coming in droves, says Raman Mohan. A drive to their favourite dhaba in the dead of the night is their idea of chilling out, say Tarun and his buddies from Punjab Engineering College, Chandigarh. A departure from the plush, classy but predictable hangouts like McDonalds and Baristas, dhabas are fast emerging as change-of-scene haunts for the young mobile brigade. "There’s nothing more refreshing than a long drive to a dhaba," remarks Akanksha, a young lawyer, who makes it a point to visit those on the Kalka-Shimla highway. Away from the confines of the city, the drive to these eateries is not only enlivening but also gives temperamental teenagers some time to be on their own. As Shikha, a collegiate puts it, "Eating out at dhabas, you don’t feel constricted. You can yap all you want, and let your hair down with no qualms to bug you." With the younger set gravitating towards dhabas, these eating stalls have been jazzing up their act to cater to the burgeoning number of motorists on the highway and foodies fond of dhaba delights. Shedding the ambience of the charpoy culture, the dhabas have gone in for a flashy, young-at-heart makeover. The dhabas of yesterday have been replaced by the desi drive-ins of today. The old order has never yielded space to the new in any other business as speedily and as much as it has for the eateries that now dot the Sher Shah Suri Marg. It’s the new world order that rules the roost at the reincarnated hybrids of dhabas and restaurants. The owners are young. So are the customers. The trucks and the truckers who nurtured the dhaba culture for several decades have been elbowed out by the swank new cars and the hip-hop crowd that comes in them. The tadka dal and the fried paranthas are history. The "100-mile" cuppa tea is extinct. The homely cots and wooden planks have been consigned to the flames. These eating joints are anything but dhabas. Dhabas were art, but their reincarnations are kitsch, literally and truly. Unfortunately, the "blessed" place - Murthal, near Sonepat - that took the dhaba culture on the country’s literally number one highway to dizzying heights was also the first to drive a nail in the dhaba’s coffin. 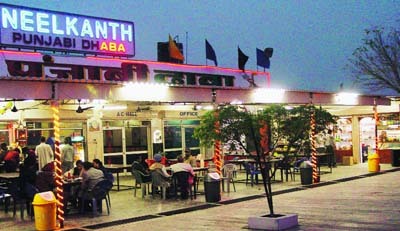 Murthal’s dhabas came into prominence in the late 1970s mainly because of their famed kali mah ki dal and fried paranthas. It is said that a Naga sadhu named Kali Baba gathered the Murthal dhaba owners one fine evening sometime in 1980 and told them they were in for great prosperity in the years to come. But, he said, there was one condition - none of them should sell eggs and non-vegetarian food in their dhabas. The holy man left that night. In the months that followed, the dhabas which offered the food banned by the Baba closed down. Those who heeded him, saw their business flourish. Since then, eggs and meat have not been sold at Murthal. Of course, the dhabas and their owners have flourished since but at the cost of the dhaba culture itself. Murthal dhaba owners now believe Kali Baba was a visionary who foresaw that the Maruti car was soon to change the Indian roadside eating culture forever. But what even the holy man apparently didn’t envisage was that the arrival of the Maruti would also mean the virtual-disappearance of the very dhabas he had blessed. Till the arrival of the Maruti, truckers and busmen were the main customers of the dhabas on the Grand Trunk Road. There were a few cars on the highway. Most of these were the bureaucrat’s white Ambassadors which never stopped on roadside dhabas. 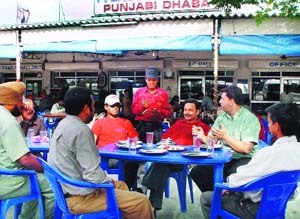 The Fiat (Premier) owners who relished dhaba food were too few. Thus, all dhabas preferred cots and wooden planks over chairs and tables as tired drivers could relax there before and after the food. But, the Maruti brought with it a whole new generation of customers who couldn’t stomach the rustic ambience of the cot and the thali. By the late 1980s, the complexion of the clientele had begun to change substantially. More cars on the road meant more demanding young customers whose preferences were entirely different. The new patrons of dhabas were mostly urbanites who travelled with their families. And, dhabas began selling more matar paneer than kali dal and karhi chawal. The cots gave way to tables and chairs, and the stainless steel thalis and katoris were replaced by crockery. By this time another change was taking place. The ownership pattern of the dhabas was also changing. The business was being taken over by young sons, with whom the new class of customers appeared to be more at home. Dayanand Sandhu (34) is a classic example of the new mindset of the young owners. He assisted his father at Murthal’s famed Pahlwan Dhaba since childhood. He remarks: "Everything has changed. My father never permitted my mother to come to the dhaba. It was taboo. Now my wife Sudesh runs the day shift and I look after the night shift. Isn’t that some change? Times have changed and dhabas have kept pace with the changing scenario." He says his father replaced cots with dining tables and chairs in 1983. But the major change occurred as late as 1996, when the road was four-laned and dhabas were asked to move back 100 metres from the highway. This meant the owners had to completely rebuild their eateries. "By this time, the clientele had grown and we had more funds for bigger establishments." Dayanand reminisces that by then most cars on the road were air-conditioned. In summers the hip crowd found it difficult to eat under fans. So, in came the air-conditioned dining halls. In the years that followed there were more young men and women and small families travelling in fast-moving cars with hi-fi stereos. Soon most dhabas had rented out small kiosks selling music cassettes. The young families had children who demanded toys and packed snacks. Gift shops and snack counters were the next natural addition. "Everybody wanted to travel light. We saw business in general merchandise, therefore added that counter. The car owners wanted their windshields wiped clean while they ate, so in no time this facility became a standard service." The new-look dhaba trend has rapidly caught on. Now towns like Karnal and Panipat too have their own versions of the dhabas of the new millennium. The most common feature among them is naturally the young clientele. The food too is for the young. Dayanand has no compunction admitting that what he now runs is "certainly not a dhaba but a roadside restaurant for the youth". He says: " There are no customers demanding Murthal’s famed kali dal. Instead of our patent fried paranthas, we are selling tandoori paranthas. The customers love them. But, frankly, I don’t. The earlier paranthas were tastier. The new health conscious generation prefers fat-free food and dhabas which were never known for this variety of food are now giving in to the whims of customers." And that’s not the only change. The typical ‘filmi’ dhaba waiter rapidly rattled the names of the dishes available with a duster thrown on his right shoulder. Now, his place has been taken over by the menu card. The karhi-chawal has been replaced by chowmein and chilly cheese; lassi has made a quiet exit in favour of colas and fruit juices; and the pizza is putting the tandoor out of work. Krishan Lal, who runs another popular dhaba, says even the cooks are younger. "In the old days we had elderly cooks who specialised in just the traditional stuff like saag, dal and karhi. But to satisfy the younger customers, we now have Garhwalis and Nepalis running the show. They are able to offer more variety. Earlier, no one ever cooked mushrooms in a dhaba. Now, mushroom dishes are a rage with youngsters. And, so is ice-cream. Only a handful now ask for kheer or phirni. We have changed to meet the tastes of the youth, who have been brought up on ice-creams and sundaes," he said. Perhaps the only reminder of the past is the mandatory hall with cots for the travellers to rest. But, sadly, only truckers — if there are any who stop — use the facility. The younger generation has neither the time to rest nor the inclination to use a charpoy. And this is not without reason. The dhabas are no longer the territory of the motorists on a long drive. Sonepat but also from as far away as Delhi. On weekends, dhabas at Karnal and Panipat too spill over with food-lovers, who enjoy driving down to these eateries on the outskirts of their towns. Ample parking space and quick service attract the youth. Low cost is another factor that tugs cash-strapped youngsters to these wayside joints. The food prices at the modern dhabas may not be as low as those of the dhabas of the past but they are still way less than restaurants in cities. Explains Rajnish Atre, a resident of Delhi: "My wife and I are fond of eating out. So are our children. But I cannot afford a five-star restaurant which is the trend among the newly rich and the young in Delhi. Besides, the family prefers the long drive on the highway to wasting time on Delhi’s crowded roads. Under such circumstances, highway dhabas make sense". The young dhaba owners may have struck gold in the post-Maruti era, but respectability still eludes both them and their eateries. Most of them do not want their children in the business despite good money. "The dhabas may have changed, its respectability has not", says Dayanand, who wants both his son and daughter to be computer professionals. What lies in store for the dhabas in the near future is as difficult to predict as its clientele. The Grand Trunk Road, perhaps, boasts of the largest number of dhabas. K. K. Khullar says that famous travellers like Megasthenes and Hieun Tsang have testified to the joy of eating at these roadside stalls. Dhaba is now part of English vocabulary, but its delicacies have remained Indian — as Indian as rogan josh. At most dhabas now you are likely to meet an English-speaking waiter. And the more decorative a dhaba, the more customers it attracts. With the passage of time, the serais that Sher Shah Suri had built on the G.T. Road have disappeared and dhabas have appeared. There must be more than a hundred dhabas on the G.T. Road from Delhi to Amritsar, almost each one specialising in a particular item. A dhaba was originally a roadside eatery with some charpoys and stools put out in the open, and a boy or two in attendance, ready to serve you a sizzling hot meal and tandoori rotis fresh from the earthen tandoor. Today the G.T. Road dhabas are fitted with music systems, playing the latest film songs. In the midst of everything new, you find some dishes whose recipes have remained almost unchanged over centuries. You can have the khichri of the days of Shahjehan, called the Shahi Khichri with 105 ingredients. Dhabas are different from English pubs where malt and ale flow like water. They are also different from the French inns, Polish roadside eateries, German motels and even from the dhabas in Central Asian Republics of the erstwhile Soviet Union such as Bokhara, Samarkand and Andijan. A G.T. Road dhaba is a halting place for rest and recreation, and indeed, for a quick bite, for a Border Omlette on the Delhi-Haryana border. This omlette has a special flavour, like the Pakistani omlette I ate at Islamabad and the Thai omlette I enjoyed on the streets of Bangkok. The most interesting aspect of these dhabas is that they are warm in winter and cool in summer. Known for their Punjabi saag and Haryanvi dal, they cater to all tastes. You can have karram of the Jammu hills and katchalu of Kangra. Dhabas on the Delhi-Sonepat road are famous for sizzling hot bread-pakoras. Traveller after traveller from Megasthenes and Hieun Tsang to Al Barauni to Bernier and Tavernier have testified to the joy of eating at such places. You have saag pakora with satranga achar. In Panipat you have egg pakoras, while on the banks of Karna Lake you can have cheese pakoras, a unique delicacy. The dhabas in Haryana are named after birds, while the Punjabis still name their dhabas after themselves for example Puran Da Dhaba, Madan Da Dhaba, Kishen Di Purian, Baldev De Choley. At Jalandhar cantonment, you can have hing pakoras, and when you are in Amritsar, you can have dahi ki sabzi. You can sit and eat inside your parked vehicle while you listen to truck drivers converse with each other. There is life in these eateries, and spice too. There is joy here, a friendly smile.